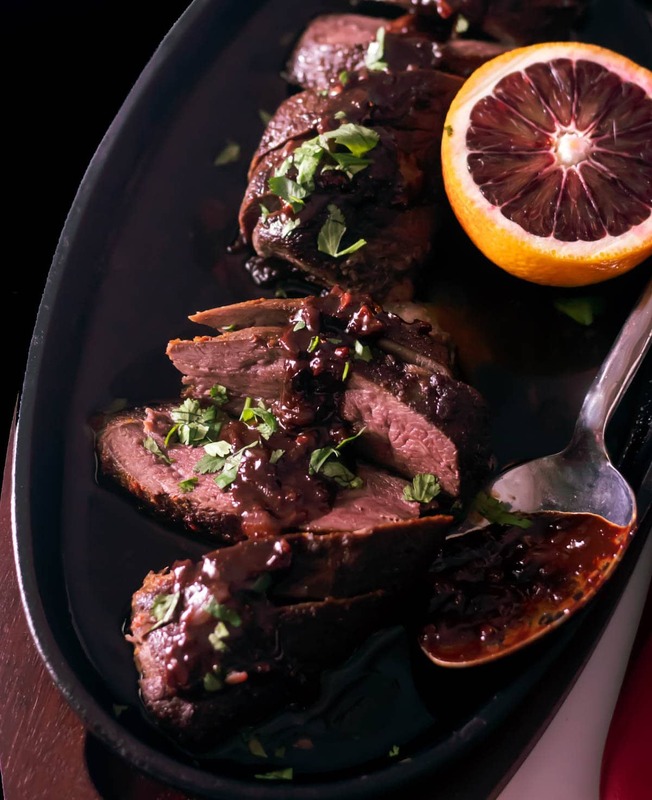 Tender, succulent duck breasts get a quick sear after their hot bath, and slathered in a gorgeous sauce. 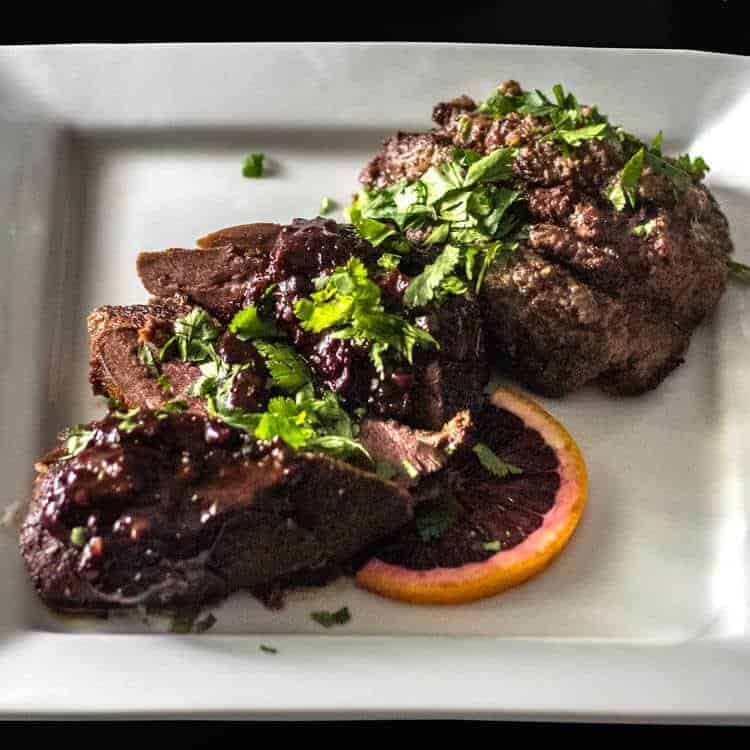 Savory Blood Orange Chocolate Sauce On Sous Vide Duck Breasts, served with a Roasted Cauliflower and Garlic Mash is sure to “wow” even the most discerning palate! A special meal for two! I have cooked duck – a few times. You may remember my Za’atar and Pomegranate Molasses Roasted Duck recipe I posted for Christmas 2015? Well, maybe that’s stretching the limit of the average blog reader’s memory? The succulent flavor had me wanting to do duck again, but I really wanted to do breasts only. I finally got my hands on duck breasts at our local Latino market (Ruben’s). Never one to post a recipe until it’s perfected, I played with the sauce first on less expensive but definitely not cheap quail medallions. The sauce is Mexican-ish (is that a word? ), with its citrus, chocolate, cumin flavors. No roux or thickening agent required. 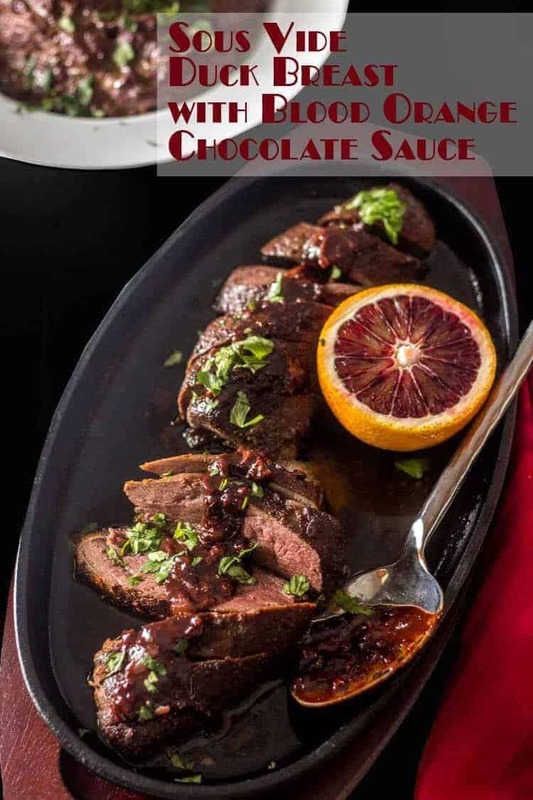 😀 Try this delicious Savory Blood Orange Chocolate Sauce on any poultry or even pork! Duck breasts come in many sizes, and may be domestic and commercially produced, or they may be wild and taken in a hunt. My very first experience with duck was with wild duck that a friend “donated” to me because she knew I would know what to do with it. The ducks were quite small, and had been plucked and cleaned. They were bony and difficult to prepare and eat due to their small size. The commercial ducks I find are MUCH easier to work with, and breasts are a breeze! When I ordered my duck breasts, I had a choice of small, medium, and large. The small – at 6 to 8 ounces each – are a perfect size. You lose a little to fat, but not much. I aim for 4-6 ounces of protein, so they worked out well. While duck breast is not as lean as chicken breast, it can certainly be a healthy addition to your diet. It is high in protein, and key vitamins (B-5 and B-12) and minerals (selenium and zinc). Choice of cooking method and healthy sides make it an excellent option for a special occasion meal with your love. 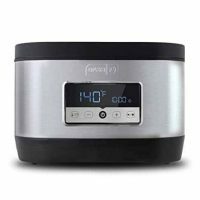 I chose to sous vide (sounds fancy and intimidating, but it’s really simple). Sous vide is the perfect method for duck. I wanted medium rare, and set the temperature for 130°. I cooked it for about an hour and 45 minutes. While the duck hangs out in its hot tub, I prep the ingredients for the sauce (mis en place), and make the sides. Note: We prefer duck medium rare. The beauty of sous vide cooking is the duck will not get over cooked. If you prefer it more cooked, adjust the temperature accordingly. I have to put in another plug for “staying in” for Valentine’s Day… Savory Blood Orange Chocolate Sauce On Sous Vide Duck Breasts, Roasted Cauliflower and Garlic Mash, fresh escarole with a citrus vinaigrette, and a bottle of Lawrence Dunham Vineyards 2012 Petite Sirah beats a crowded, noisy, expensive restaurant hands down and any day of the week. We’ve enjoyed a quiet meal at home Valentine’s Day for years (after our 4 sons left the nest!). Start to finish, you need a little over 2 hours to complete the two dishes. I am including the recipe for the Roasted Cauliflower and Garlic Mash in this post because it was fabulous with the duck and its sauce. At some point, though, the cauliflower will be a stand alone recipe (because it’s that good). If you do not have a way to sous vide the duck, all is not lost! I like Gordon Ramsay’s method: How to Cook Perfect Duck Breast. Pick up the instructions after the seared duck is resting with a foil cover. Pat the duck breasts dry, and season generously with salt and pepper. Place in an air and water tight bags (vacuum or zip bags). Make sure all the air is removed. Place in water bath at 130 degrees for about 1 1/2 hours. (see notes) While duck cooks, gather and prep ingredients for the sauce and any sides. Remove duck from the bags. Pat dry thoroughly. Place breasts skin side-down in heavy-bottomed 12-inch non-stick or cast iron skillet and set over high heat until sizzling, about 2 minutes. Reduce heat to medium and cook, moving and pressing breasts to ensure good contact between skin and pan until golden brown and crisp, about 5 minutes. Flip and cook second side until barely colored, about 30 seconds. Transfer to paper towel-lined plate, cover with foil, and allow to rest while making the sauce. Remove all but about a tablespoon of duck fat from the pan. Add the minced shallot and garlic, and saute about a minute over medium high heat. Add cumin, and saute another minute or so. Deglaze the pan with sherry, scraping any browned duck bits. Stir in the juice and zest, chocolate, agave nectar (if using), and bitters (if using). Season. To Serve: Slice duck into 1/2" thick slices. Top with the blood orange chocolate sauce, and garnish with cilantro. You want a generous 1/4 cup of orange juice. Blood oranges are not available year 'round, and not in every area when they're in season. Substitute any good, fresh orange (medium-sized) with lots of juice. Keep in mind the color of the sauce will not have the red tint. The bitters are optional. They add depth and complexity, but you will have an excellent sauce without them! If you use a chocolate that is less than 86% dark, you may want to taste the sauce before adding the agave nectar. 86% has no sweet taste (to my palate), so I feel the hint of sweetness is necessary. I also made the sauce with a 64% chocolate, and omitted the agave nectar entirely. Don't forget to season the sauce! If you don't have a way to sous vide the duck breast, follow Gordon Ramsay's How to Cook Perfect Duck Breast. Pick up the instructions after the duck is seared and set aside to rest. I have a Tasty One Top (induction burner) that has an iPhone app and a temperature probe that work together to keep a precise water temperature. 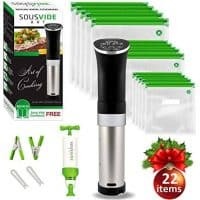 I do not have a sous vide appliance. 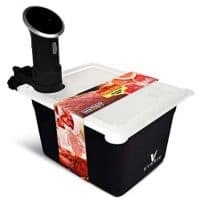 There are options that range from a stand alone appliance to a probe/phone app, to a digital probe that can mount on the edge of your cookware and heats and maintains the water. I have a chef friend that did a huge number of rib eyes in a Yeti cooler with the digital probe/heater inserted. Cool! Serious Eats is a "go to" resource for me. You can actually leave the duck in its bath for up to 4 hours. See Sous Vide 101: Duck Breast Recipe. Macronutrients (approximation from MyFitnessPal.com): 389 calories; 36 g protein; 24 g carbohydrates; 14 g fat. Macros based on 2 - 6 ounce duck breasts. This simple side dish is so flavorful, and a low carb option for your Sous Vide Duck Breasts or your favorite main course! Preheat oven to 400 (375 convection roast). Remove any loose papery skins from the garlic bulb. Using a very sharp knife, cut off the top 1/4-1/2" of the garlic bulb - exposing the garlic cloves. Place cauliflower florets and garlic bulb (exposed cloves up) on a baking sheet. Drizzle with olive oil. Place in preheated oven. Cook until tender with some nice caramelization (about 20-30 minutes). Squeeze garlic cloves out of their skins (they should be quite soft). Add to the bowl of a large food processor. Add the yogurt and butter. Pulse until smooth, adding broth and seasoning as necessary. Scoop Roasted Cauliflower and Garlic Mash into an ovenproof dish, and pop back into the oven to stay warm until ready to serve. Garnish with fresh herbs as desired. I love colorful food, and used a gorgeous head of purple cauliflower for photo day. I had originally planned orange, but the purple looked more fresh. The purple probably wasn't the best choice as it matched the duck and sauce! Macronutrients (approximation from MyFitnessPal.com): 210 calories; 12 g protein; 26 g carbohydrates; 11 g fat. Based on 2 very generous servings. 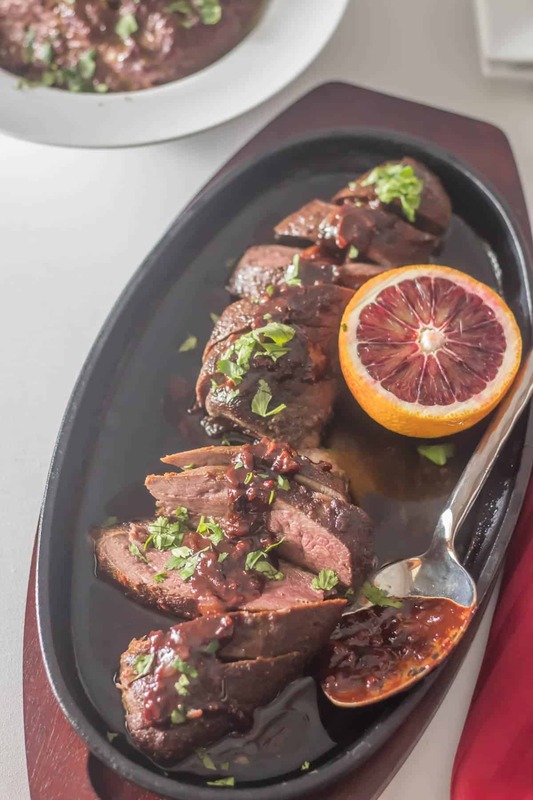 I absolutely love citrus season and the pairing of the blood oranges with the duck is perfect. What a scrumptious dish! I grew up eating wild duck and I have to admit that I would much rather have domestic duck. Better texture and flavor IMO. Sounds like you order your duck Do your buy it online? Locally, it's prohibitively expensive so I rarely make it. Would love to try this recipe. I'm with you MJ! Wild duck is good, but yes, the texture and flavor of domestic suits me better... I have a local Latino market that is owned and run by a chef. He will order anything for me, but he does stock a few duck breasts. I think the 2 for this recipe came to $28.00. It's expensive, but I do splurge for special occasion dinners. It still beats restaurant prices, right? What an amazing meal this was! One of the best ever. Don't overlook the possibility of using the sauce on a cheaper protein. It was! I loved the sauce on the sous vide quail medallions too, but the duck was divine!